"It kills pests of all sorts, contains soothing aloes to keep your pup comfortable, and even works on cats." "Includes rosemary, mint, and cedar oils in its formulation, so you can be sure your pup will both smell terrific and be free of pests." "With a coconut berry fragrance and coconut conditioners, it goes on easy and reliably kills ticks, fleas, and lice." "It is 100 percent all natural and free of irritants that could make your pup uncomfortable." "It includes a soothing oatmeal and citrus scrub that works like kryptonite against flea allergy dermatitis." "A gentle, safe, and 100 percent natural solution to help combat fleas." "It's formulated to be safe for both dogs and puppies and helps clear up dry, flaky skin." Looking for a shampoo that’s great for nearly any pooch? Adams Plus Flea & Tick Shampoo checks all the boxes: It kills pests of all sorts, contains soothing aloes to keep your pup comfortable, and even works on cats. Enriched with oatmeal and coconut extract, it’ll leave your best friend’s coat looking shiny and lustrous. It also helps get rid of dandruff and dirt while keeping them tick- and flea-free. Don’t make the mistake of thinking flea and tick shampoos need to smell like a concoction of noxious chemicals. As this product from Wahl amply demonstrates, it can smell just as good as your dog’s standard shampoo—perhaps even better. Wahl Flea and Tick Shampoo includes rosemary, mint, and cedar oils in its formulation, so you can be sure your pup will both smell terrific and be free of pests. The ingredients are plant-derived and free of harsh chemicals and it comes in a 24-ounce bottle. Customers recommend it highly, noting that it also left their dog’s fur far softer than other products they had tried in the past. Cats, especially those that spend the majority of their time roaming outside, are prone to flea infestations. Keep them safe with Sentry PurrScriptions shampoo, which is formulated specifically for felines. With a coconut berry fragrance and coconut conditioners, it goes on easy and reliably kills ticks, fleas, and lice. Appropriate for cats and kittens over 12 weeks of age, this shampoo will also leave your pet’s fur looking shiny—and more groomable than it was before. Sentry PurrScriptions is a wallet-friendly pick and is available in a 12-ounce bottle. Reviewers said it worked wonders for their cats, adding that it’s one of the rare flea shampoos for felines that consists primarily of natural products. With soft fur and sensitive skin, puppies have different needs than older dogs. It’s important to keep those needs in mind when purchasing flea and tick shampoo. Our top pick is this product from Arava Dead Sea Pet Spa. Their Intensive Bio Care Flea & Ticks Botanical Shampoo is 100 percent all natural and free of irritants that could make your pup uncomfortable. Formulated with 26 minerals from the Dead Sea, it’s guaranteed to quickly solve your puppy’s flea and tick issues while refreshing their coat and skin. 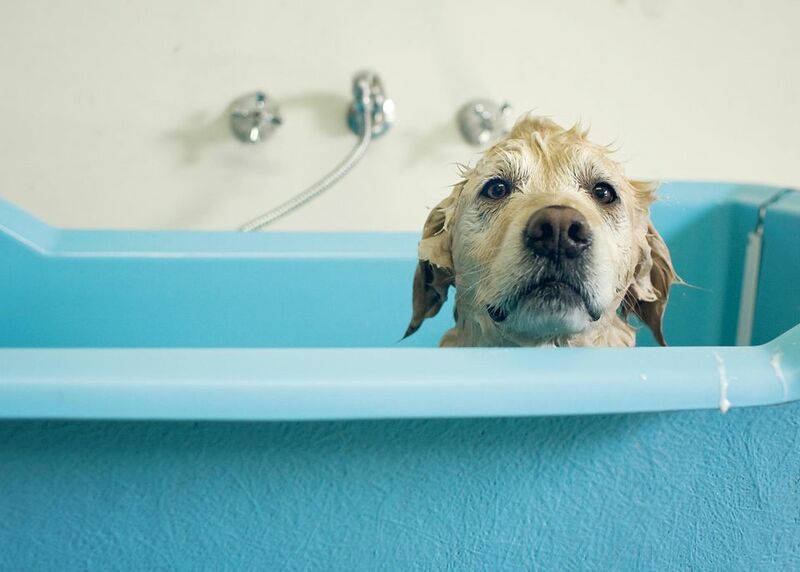 Customers say this shampoo leaves their pup smelling great, adding that the all-natural ingredients are as effective as shampoos formulated with chemicals. It also leaves owners confident they’re not exposing their dog to harsh ingredients. Additionally, for every purchase, the company makes a direct donation to an animal rights organization. It’s a fact of life: Fleas are itchy. And when your pet’s got a case of them, they can begin to scratch excessively, resulting in an unhappy pup or cat and patchy, irritated skin. Vet's Best Flea Itch Relief Dog Shampoo is manufactured with your pet in mind. It includes a soothing oatmeal and citrus scrub that works like kryptonite against flea allergy dermatitis. Of course, the shampoo itself is also free of irritants that could potentially aggravate your animal’s case of the itchies. Suitable for dogs and puppies over 12 weeks (check with your vet before using with cats), reviewers say this shampoo leaves their pet far more comfortable than they were before. While some customers do say the product kills fleas, bear in mind that it’s intended to reduce itching—it’s not a replacement for flea and tick shampoo. Want to take care of pesky fleas, but you’re not into harsh chemicals and irritating additives? SynergyLabs Richard's Organics Flea & Tick Shampoo is a gentle, safe, and 100 percent natural solution to help combat fleas. Safe for dogs and puppies over the age 12 weeks, this shampoo works to repel fleas, ticks, and even mosquitos from your dog’s skin. It’s formulated with cinnamon oil (shown to kill mosquito larvae), cedarwood and clove oil (treats inflammation and irritation), and peppermint oil (known to be a natural pest repellent). It’s paraben-free, pH balanced, and soap and dye-free, so it’s gentle on your pet’s skin. Additionally, it won’t remove any spot-on flea treatments, which makes it a great companion to your traditional prescribed flea medicines. For maximum effectiveness, allow SyneryLabs shampoo to soak for a few minutes before washing off. Reviewers say it has a very strong smell—perfect if you hate the smell of wet dog—and note that it works well without irritating skin or matting long fur. If your pet’s the sensitive type (sensitive skin, that is), you’ll want to buy a flea and tick shampoo that’s specially formulated for their needs. Our pick is Sentry Flea & Tick Shampoo, which prominently features oatmeal—a known soother—in its list of ingredients. Sentry is known as one of the most potent brands on the market. While it won’t irritate your pup’s skin, you can be sure it’ll rid them of fleas and ticks. It's formulated to be safe for both dogs and puppies and helps clear up dry, flaky skin. Amazon customers note that it’s the only shampoo that’s managed to give their allergy-prone pups some relief. Some even added that it’s “literally the only shampoo” they will buy.